Fingerprint scanners are all the rage, yet new research shows that this is just the beginning of biometric identification. 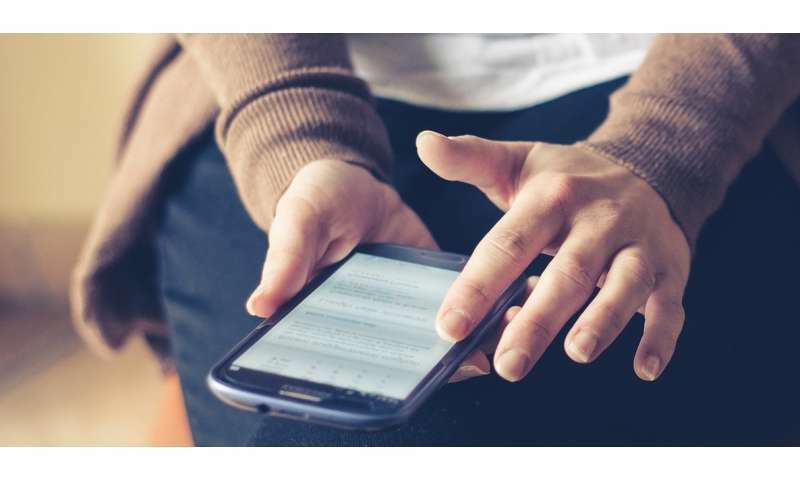 With millions of people around the world now using fingerprint readers, facial recognition software and iris scanners on a daily basis to access their smartphones or to authorise mobile banking services, there is a need to ensure these remain secure. Hackers have shown it is possible to fool smartphone fingerprint sensors, for example, into giving them access to devices, while others have developed ways of breaking into devices that require facial recognition or voice identification. The solution is to use the array of sensors in a smartphone to recognise the owner, and add extra layers of security when the phone gets picked up by a stranger. 'You have a lot of sensors on mobile phones like screens, gyroscopes, GPS, cameras, microphones – these all provide information you can use to support authentication,' said Dr Richard Guest, from the School of Engineering and Digital Arts at the University of Kent, UK. Dr Guest is leading a team in developing software that can identify someone from the way they swipe the screen, the orientation they hold the phone in and the way they move when it is in their pocket, as part of an EU-funded research project called AMBER. In one recent study, Dr Guest and his colleagues showed it is possible to determine whether someone is male or female just from the way they swipe. But biometrics are not just useful for protecting against criminals – it could also be used to catch them. The confident swagger of a thief who thinks they have got away with it could become their downfall thanks to an arsenal of new forensic techniques being developed to identify suspects. In a world where many criminal acts are now caught on camera – whether by closed circuit television or mobile phone footage shot by bystanders – it is opening up new ways to track down those who break the law. Researchers are developing methods using computer vision that can automatically identify someone from the way they walk or from pictures that only show part of their face. 'The goal is to make them reliable enough for identifying people that they can be used as evidence in court,' explained Professor Chang-Tsun Li, a computer scientist at Warwick University in the UK who is leading an EU-funded research project called IDENTITY. Most of us can recognise people we know from the way they walk, often without even realising we can. The way they shift their weight as they swing their legs, how much they bounce up and down, and the position of their body can all give them away. But using this information in criminal investigations has proven to be difficult – only a handful of experts have the ability to break down the way someone walks sufficiently to use it to identify them. Professor Li and his colleagues, however, want to use the ability of computers, aided by machine-learning algorithms, to spot extremely subtle aspects of someone's gait to better use it as a marker of identity. They have already developed algorithms that can be combined to identify individuals from their gait even in low-quality videos with an accuracy of up to 90 %. Fingerprints, by comparison, have a matching accuracy of 99 %. The ability of computers to identify someone from their walk gets even worse when they are wearing clothes that make it hard to see their movements or if they are carrying a bag. Even changing a pair of shoes can alter how someone moves. Professor Li and his team, however, have developed a way to tackle this shortcoming. By dividing the human body into segments, they can teach the computer to recognise clothing that might disguise how someone walks - like a large coat - and ignore that part of the body. Instead the system focuses on the parts that move, such as the legs, the head and arms. In experiments they were able to recognise test subjects from their gait even if they changed clothes 94 % of the time and 91 % of the time if they were carrying a bag. Other types of biometric identification are already in use. Facial recognition, for example, is widely used at border control in airports. But the technology can be easily overcome if someone covers their face or wears a mask, in much the same way as fingerprints can by wearing gloves. Some criminals can go to even more extreme lengths to avoid the authorities by undergoing plastic surgery. This has led scientists in the IDENTITY project to develop software that can defeat attempts by criminals to camouflage their identity in this way. Their algorithms work by mapping each face and the location of different facial features and then comparing them with a database of images until it produces a match. It can already match images of people before surgery to their faces after they have had operations to reduce the size of their nose, plump up their lips or had sagging skin lifted. Another approach is to look for traits that are far harder to hide. Professor Jean-Luc Dugelay, a researcher in image engineering and security at research centre EURECOM in Biot, France, is working on the automatic identification of so-called 'soft biometric traits' like gender, age, height and weight. This information could help police investigators when building profiles of suspects caught on film. 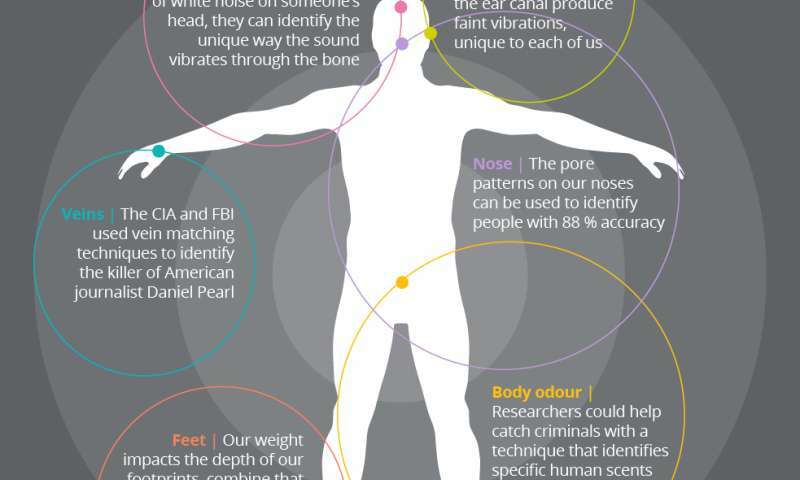 Their system looks at the shape of the body and the face to identify someone's gender extremely accurately. It can also guess someone's age far more accurately than humans.